This marks the final installment of our month-long series on sustainable style, which has been brought to you by Cromwell & Cruthers, an eco-friendly, 100 percent natural shaving oil. This week, the Urban Driver — Steven Bochenek — writes on eco-friendly cars. You wouldn’t know it from Jack Bauer’s soothing voiceovers, but hybrid technology may well prove transitory. So what’s next in green? Well, when you consider the logistical challenges hydrogen fuel cells pose, the legal mess that electric cars sometimes cause, and the fact that the Chinese almost purchased Hummer, predicting the future is foolish. But here’s where we are. True electric is a long way off. 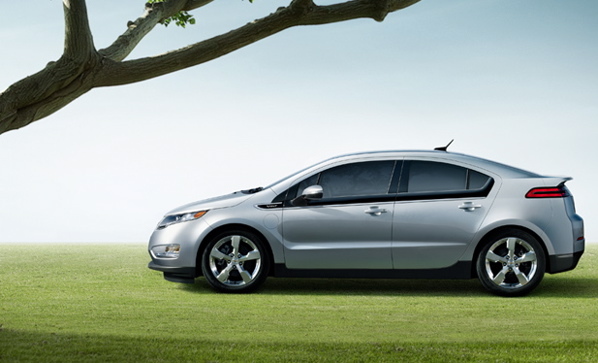 Currently, most are golf carts in gated communities; however, the Chevrolet Volt (pictured) represents the next generation of hybrid, relying largely on electricity. It’ll take you 64 kilometres before its gas engine kicks in and, even then, the gas powers the electric for hundreds more. Meaning? If you plug-in nightly, you’ll hardly burn a millilitre of gas. Launching next year, probably from about $40,000. VW TDI Jetta Clean diesel doesn’t sound green to most North Americans because we think of diesel as filth. That’s changed. This car burns 4.7L/100km on the highway. In fact, it was Green Car Journal’s Green Car of the Year last year. From $24,475. Hybrid is still the most popular consideration on the market — but the production, capacity and half-life of those batteries turn some greenies red. My favourite hybrids include the Toyota Camry, Lexus 450H, the immense Chevrolet Silverado and Kiefer’s own Ford Escape. There are no cheap options yet. The best advice may come from the smartasses on “Top Gear”: It’s not what you drive, but how you drive it. Ecology — and economy — happen between primarily your ears. you guys didn’t mention Tesla Motor company… they have a full electric car that’s in production right now. As far as I know it’s the only fully electric production car on the road right now. Since it’ll go 340 km’s in a charge it’s enough fo everything but a road trip. Sure the roadster is out of most of our price ranges but the Model S will start being delivered in 2012. It will be more viable for most or us. As far as green is concerned the cost of recycling the battery is included in the purchase of the car meaning it’s the dealers will responsibly deal with them. Yeah, the MSRP of the Tesla Roadster is $109,000USD (assuming you can even get one, which you can’t). The Model S sounds interesting, though — thanks for the suggestion. I have been driving a Toyota Prius for 2-1/2 years with near-total satisfaction. The “original” hybrid hatchback is very quiet, has adequate acceleration if necessary even if the fuel economy hovers around 7.4L/100km during summer – probably because of the A/C. But it is still a classic of its type! And its body type is like no other!